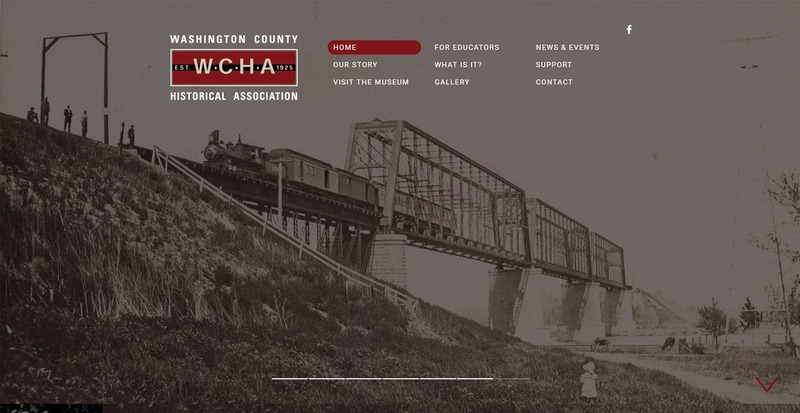 Washington County Historical Association (WCHA) plays an important role in supporting the community and educators, keeping history alive for the entire county. The WCHA website serves as a marketing piece to serve visitors and educators. Perhaps the most unique aspect of this website is the client’s own materials. Being a historical association with access to hundreds of unique images, our Omaha web design team could utilize this resource to create a compelling website design. While the overall website style is reflective of its mission and services, the website images truly add a personal and unique design component – which many websites lack. This pre-built WordPress template offers our Omaha web designers flexibility with respect to design and development, but also offers flexibility for WCHA in updating their website. Additionally, this WordPress website is mobile-friendly, utilizing responsive technology. Seeking success in the search engines starts with a strategy. The strategies built by our Omaha SEO team are built on data – current analytics, competitors and overall website structure/effectiveness. One of the offerings we can provide with our SEO services is a one-time optimization. The goal of this one-time optimization is to fill one small need in a larger. long-term strategy and provide Google with information it needs to accurately and effectively rank your website among your competition. Google seeks many requirements for good Search Engine Optimization (SEO) value; but among these are website tag titles and header tags. Title tags are extremely critical in helping Google understand what a page is about and are also the first impression many people have of your page. Title tags are used in three key places, including search engine results pages, web browsers and social networks. Title tags are intended to be relevant to your business and services, as reflect your keywords as best as possible. Header tags are influential in SEO rankings, and can lead to ranking increases when used effectively. And while the use of header tags has changed over the last few years – causing some debate about it’s relevance for SEO, its purpose is not to be overlooked when optimizing a website for better search engine results. Title tags and header tags, when partnered with excellent, valuable content full of rich keywords, can provide a real benefit for SEO success. Without considering the ENTIRE value of your website, these will do little for your SEO success strategy. Why? Because Google strives to provide an excellent user experience. They consider the entire value of your website’s content (not just a sprinkling of keywords) to rank a website for relevancy. Serving a relevant result with valuable information ensures a happy end-user. JM’s one-time website SEO optimization includes a careful optimization of webpage title tags and header tags for each website page. Additionally, our Omaha web marketing team will craft a creative meta description for each page. A meta description is a 300 character snippet pulled in by the search engines to describe each page. Meta description tags are extremely important in gaining user click-through from search engine results pages and should accurately reflect the content of the page. By attracting the RIGHT users with a compelling and accurate meta description, you’ll ensure increased time on site and a lower bounce rate – both key component for a successful SEO strategy. Whelan Brothers, LLC, has been serving the Omaha-metro with lawn, landscaping and snow services since 2006. With no website, this lawncare company had no online presence – missing out on many potential customers. Partnering with our Omaha web design team, Whelan Brothers has a new website which features their services and work. 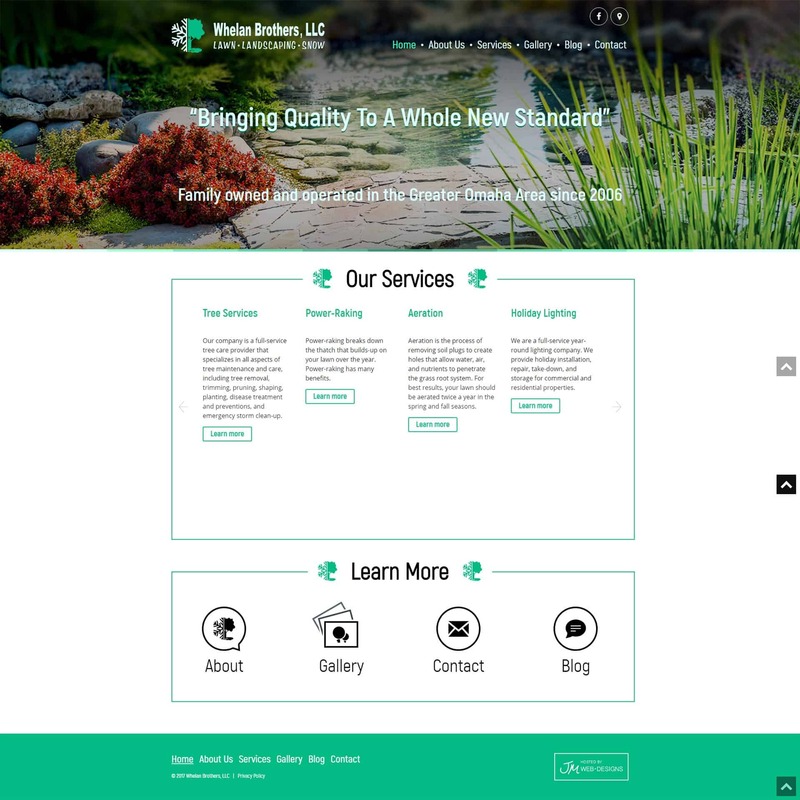 This new website is a prebuilt WordPress template, customized to showcase Whelan Brothers brand and services. It also uses responsive technology, and is mobile-friendly – offering a better user experience for mobile and tablet users. Our Omaha web design team wishes Whelan Brothers great success with their new website! Great Plains Underground Construction (GPUC) is a sister company of Great Plains Communications, a long-time partner of JM. 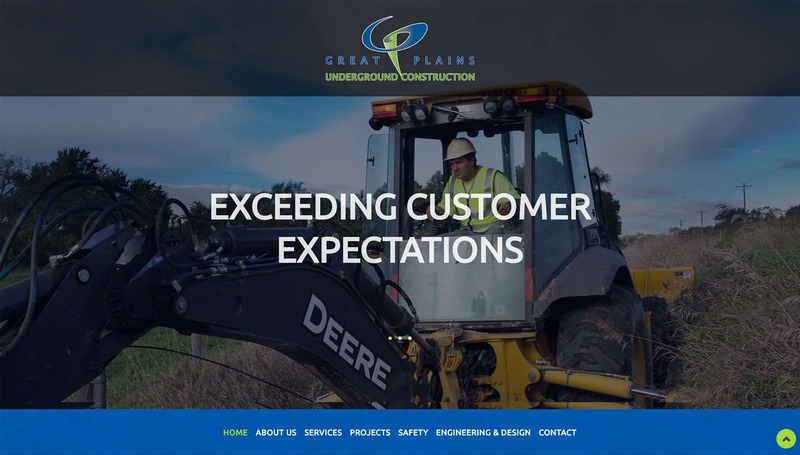 After years of building a strong relationship with the leadership at Great Plains Communication, our Omaha web design team built a new website for the underground construction division. This website is a prebuilt WordPress template customized with GPUC’s information and branding. As an informational website, this website is clean, simple and easy to use. It’s also considered mobile-friendly, as it includes responsive technology. Finally, this website is equipped with professionally crafted title tags, header tags and descriptions to assist in Search Engine Optimization (SEO) success. 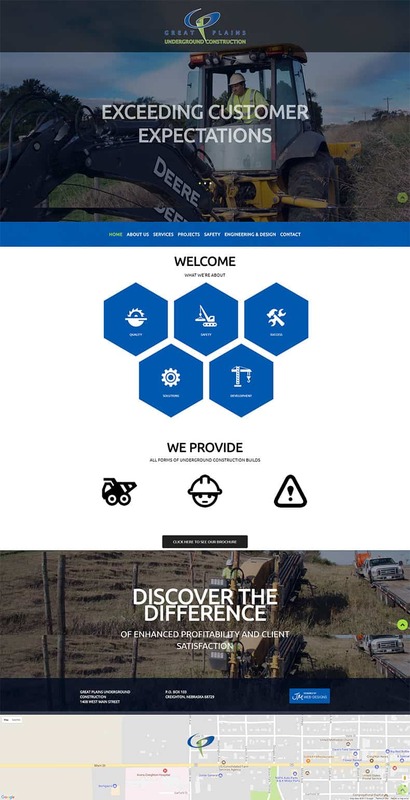 We’re thankful for the continued trust and partnership between Great Plains companies and our Omaha web design and development team and we wish them great success with this new website. Our Omaha web design and support team is growing! JM Web Designs is looking for a motivated and responsible technical support specialist who will ensure the success of our website, email and hosting customers. This technical support specialist is responsible for providing excellent customer service and support to JM’s customers. Provide answers to clients by identifying problems; researching answers; guiding client through corrective steps. Stacey Dental serves the greater Omaha area with caring, professional family dental services. With so many choices for family dentistry, Stacey Dental needed an online presence to capture potential customers. Our Omaha web design team built this website on a pre-built WordPress template. Customized to fit their needs, this Content Management System (CMS) allows for easy content and image updates. Also, this new website is seen by Google as mobile-friendly, as it includes responsive technology. This website is also meeting Google SEO requirements through our one-time SEO optimization, with each web page appropriately tagged with keywords. We’re always grateful when businesses trust our Omaha web design team to design a critical marketing piece, like a website. 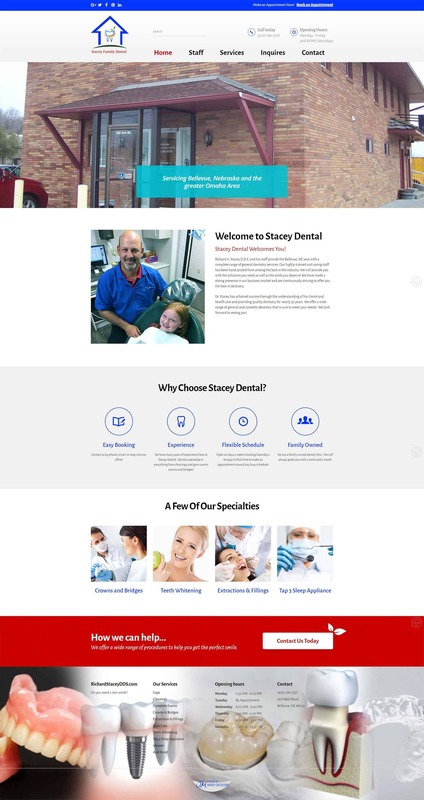 We wish Stacey Dental great success with its new website. Have you met Jordan? Jordan Murphy is JM’s account manager, continuing a long-time JM tradition of excellent customer service and expertise! As account manager, Jordan builds relationships with customers and works closely with JM employees to ensure that every project is timely, efficient and successful. With a strong customer service background, spanning from retail to advertising, Jordan goes above and beyond for every customer. Building trust and credibility with each step of our process, Jordan makes each project a priority, seeing it to a successful completion. Her strong desire to learn and grow makes her an excellent account manager and drives her in this position. Jordan is mommy to one little boy, Brantley; and as a native Elkhorn resident, Jordan loves spending time with her family who live nearby. We are thrilled to have Jordan on-board at JM. She brings experience, great energy and a passion for learning. We know once you meet her… you’ll love her as much as we do. Maybe you haven’t yet heard of Google Remarketing? Or you don’t yet understand the effectiveness and affordability of Google Remarketing? Google Remarketing is both powerful and affordable, allowing a business to retarget potential customers who have previously visited the company’s website. Remarketing also allows businesses to reconnect with users who’ve previously been to the website, by showing relevant ads as they browse the web, as they use mobile apps, or as they search on Google. The personalized, consistent and affordable exposure Google Remarketing provides has proven to boost website sales and inquiries. In fact, our Omaha internet marketing team has seen these proven results repeatedly for our own business, and for our customers. Watch our short Google Remarketing video to learn more and then contact our Omaha web design and internet marketing firm at 402.292.7500 x 102 to boost sales and website inquiries through a professionally managed Google Remarketing campaign. Heartland Oncology & Hematology is dedicated to serving and caring for their patients. Its new website is an informational marketing piece to provide information to those seeking care; and it’s minimalistic, clean design allows for just that. Heartland Oncology & Hematology’s new website is a pre-built WordPress content management system that uses responsive technology – qualifying for Google’s mobile-friendly website standards. Our Omaha web design team also built an interactive map, helping users in Nebraska and Iowa find a convenient location. As with all our clients, we are thankful that Heartland Oncology & Hematology trusted our web design Omaha team to build a new website, and we wish them success with this new marketing tool.